Matching Gifts are gifts made by companies to universities like Colorado State University-Pueblo. If you are employed by a matching gift company, your gift to Colorado State University-Pueblo could be doubled or tripled by your employer. If you find your employer has a matching gift program, request a matching gift form from your human resources department. Send the completed form, including gift information to the CSU-Pueblo Foundation; once received, Foundation staff will complete the matching gift process. 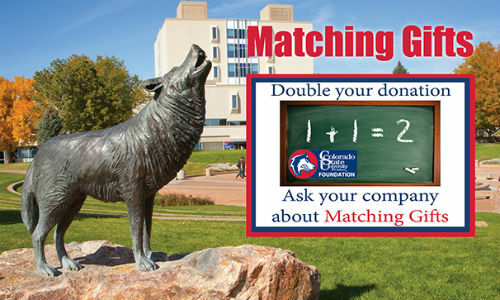 By using your employer’s matching gift program, you can greatly increase your gift to Colorado State University-Pueblo.